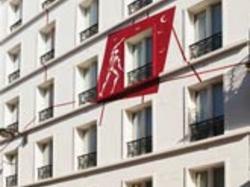 Where to sleep in Paris? 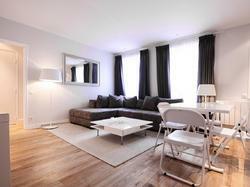 Federal Hotel offers you to book a hotel or an appartment in Paris, very easily and at the best price. Our hotels, cheap hotels or 5 star hotels, offer discounts, stays, and special offers for wonderful moments at competitive prices in Paris. 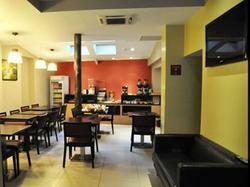 To choose a hotel, do not hesitate to compare prices and consult customers reviews. Paris, city of Lights, offers its visitors hundreds of hotels : romantic hotels, charming hotels, luxury hotels or cheap hotels, according to your way of traveling: alone, with your partner or your family, for business or to explore this magnificent city. Paris La Defense, with its Grande Arche, is the business district of Paris : it has 3 million m2 of office space on the cities of Puteaux, Courbevoie and Nanterre. In the first arrondissement, you will visit the Sainte Chapelle, the Louvre Museum, one of the most beautiful museums of the world, and the Tuileries Garden and you will watch a show at the Comédie-Française or the Chatelet Theatre. The Bouffes-Parisiens theatre and the Opéra Comique will delight you with their performances in the second arrondissement. In the third arrondissement, the National Archives, the Arts and Crafts Museum and the Square du Temple wait for your visit. In the 4th arrondissement, you will admire one of the main tourist attraction of the city : Notre-Dame cathedral. You will also visit the Georges Pompidou Cultural Center, the Shoah Memorial, the City Hall, the Bastille square and the Vosges square. The 5th arrondissement is the district of Grandes Ecoles and research institutes (Collège de France, Ecole Polytechnique, Institut Curie, Ecole Normale Supérieure,...), famous high schools (Henri IV, Louis-le-Grand...) and universities (Panthéon-Sorbonne, Assas, Descartes). It also has many religious buildings such as the Great Mosque of Paris and magnificent botanical gardens such as the Jardin des Plantes. The 6th arrondissement main sights are the Luxembourg Garden,the Hotel des Monnaies and the Odeon Theatre. It is also characterized by its bridges, listed monuments, such as the Pont Neuf or the Passerelle des Arts. When you visit Paris, you automatically go to the 7th arrondissement : Eiffel Tower, Orsay Museum, Invalides, Champ-de-Mars, Rodin Museum... You will also find many government departments and the Parliament. Several bateaux-mouches (shuttle boats) companies offer trips around Paris along the Seine river. The 8th arrondissement means luxury and Champs Elysées. You will also visit the Arc de Triomphe, the Madeleine Church, the Grand Palais and the Petit Palais, Parc Monceau, the Place de la Concorde and Alexandre III Bridge. 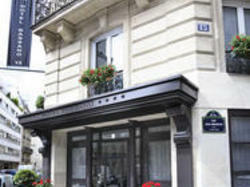 You will also find many luxury hotels and the Palais de l'Elysee. At night, you can go and applaud a play at the Champs Elysées Theatre or listen a concert at Salle Pleyel or Salle Gaveau. In the 9th arrondissement, you may visit the Grevin Museum or go shopping at the Grands Magasins such as Galeries Lafayette and Le Printemps. At night, magnificent shows are performed at the Garnier Opera, the Olympia, the Folies Bergère and the Casino de Paris. The 10th arrondissement is famous for its many listed theatres (Théatre Antoine, Théatre de la Porte Saint Martin, Théatre de la Renaissance, Théatre du Gymnase, Théatre des Bouffes du Nord). 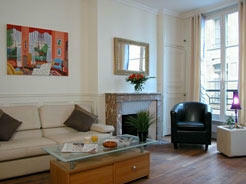 You will stroll along the Canal Saint Martin and will stop on the typical gateways. We like to visit the 11th arrondissement for its Cafés-Concerts and its theaters such as the Cirque d'Hiver, Bataclan and Réservoir. 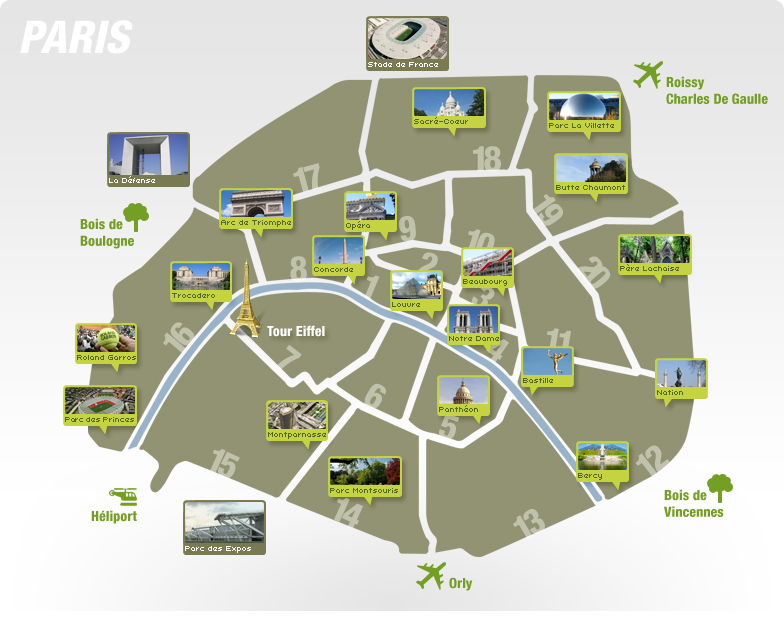 The 12th arrondissement invites you to explore its Parc Floral and the Bois de Vincennes before attending a sporting event at Palais omnisports de Paris-Bercy or a show at the Bastille Opera. The 13th arrondissement is renown for its Asian district, its Butte-aux-Cailles district and the BNF, the National Library of France and its 14 millions printed documents. In the 14th arrondissement, you may admire the Observatoire de Paris, visit the very original and historical catacombes and go enjoy the view from the top of the Montparnasse Tower. You will certainly go to the 15th arrondissement to watch a performance at the Palais des Sports or enjoy an exhibition at the Parc des Expositions de la Porte de Versailles. The district also has many beautiful bridges such as the Pont Mirabeau under which flows the Seine. 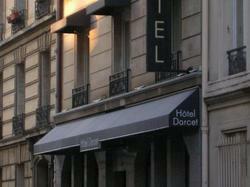 The 16th arrondissement evokes the beautiful districts of Paris. It hosts the headquarters of many embassies. 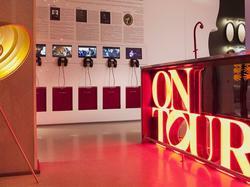 You will also find the Chaillot Palace, the Palais de Tokyo and the Bois de Boulogne. The 17th arrondissement is essentially a residential area. You will visit there the picturesque City of Flowers. The 18th arrondissement is the Montmartre district. 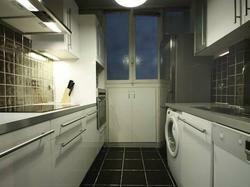 It offers the magnificent view on the very special Sacré Coeur Basilica. 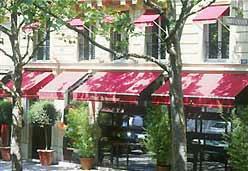 Pigalle, the cabarets district, is also very famous. At the foot of Montmartre, you can enjoy a show at the Moulin Rouge. The 19th arrondissement main sights are the Parc de la Villette, City of Science and Industry, and the parc des Buttes-Chaumont, one of the most important in Paris. The 20th arrondissement is renown for the Père Lachaise cemetery, one of the most famous cemeteries in the world, and the very typical Eglise Notre Dame de la Croix de Ménilmontant. Orlybus shuttles link the airport to Paris (Denfert-Rochereau Metro Station). You can also join the RER C by the "Paris by train" shuttle and the RER B by Orlyval shuttle. CDGVal shuttles link the airport to RER B . There is also a bus link between the airport and Paris Opera. The six main railway stations are in the heart of Paris : Austerlitz railway station or Lyon railway station for travelers from the south, Saint Lazare station or Montparnasse station for travelers from the west, Paris-Est station and Paris-Nord station. In Paris, you can travel by Metro, RER (regional train) or bus. You can also tour the city by bike, pedaling yourself (Velib') or not (Cyclobulle).